Almond Kheer to start the New Year! Auspiciousness is huge in the Indian tradition, that I grew up in. I relate it to positive thinking. It is praying, wishing and believing that all will go well. On auspicious occasions, sweets are first offered to the Gods and then distributed to all as ‘prasad’. Kheer is offered to the Gods during many festivals, all over India. Kheer is a sweet pudding made commonly with rice or thin noodles called seviya that are cooked with other ingredients like milk, cream, sugar, ghee, raisins and nuts. Rice kheer seems to be a staple in many Indian restaurants in the United States, so many of you may know about kheer. Here’s to a propitious 2015! 1 + ¼ cup milk, divided. In a blender, combine the almonds with the ¼ cup milk and blend it to a fine paste. Heat the ghee in a saucepan, over low heat. Add the ground almond paste and roast it for a minute or so over low heat. Add the 1 cup milk and stir well to combine. Add the sugar and let the mixture come to a low boil. Stir well and let the kheer simmer for about 2 to 3 minutes. Remove from heat. Add the cardamom seed powder and stir well. 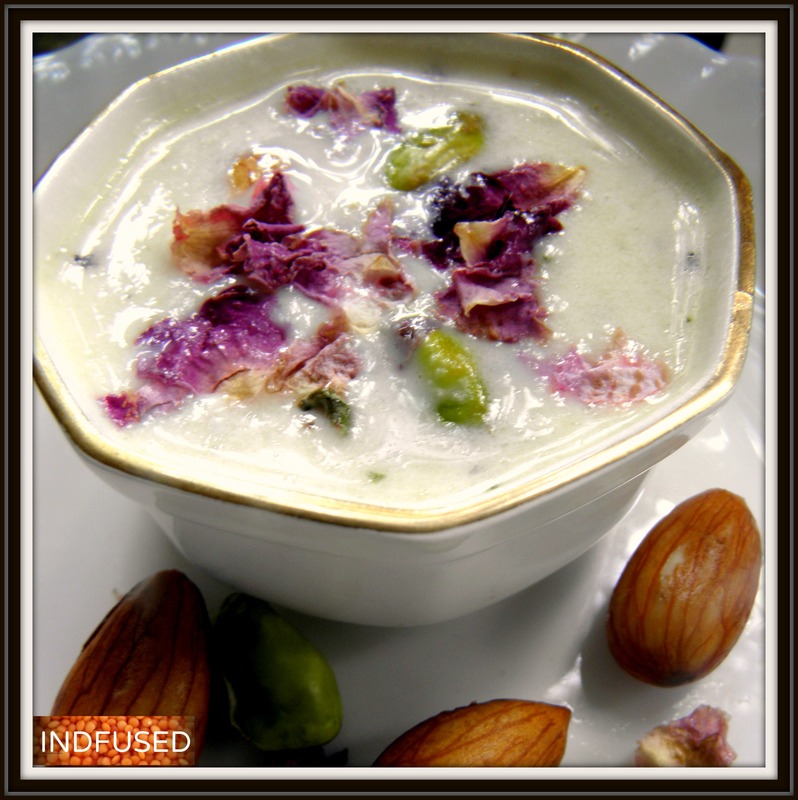 Almond kheer tastes delicious warm or cold. It thickens slightly as it cools. Serve, topped with the rose petals and pistachios. Cheers! I am joinng the New year’s party at Fiesta Friday with Angie@ The Novice Gardener, Mr Fitz @CookingwithMrFitz and Kaila @GF Life 24/7. Broccoli Zunaka -A 7 minute healthy recipe! Thanks Aruna! Happy New year to you too! Happy New Year Sandhya! 🙂 Auspiciousness is big in my family too and we start with Rice and Coconut milk with treacle!! This sounds delicious! I love kheer and it would taste amazing with Almonds! Thank you so much Dini! Rice and coconut milk with treacle sounds delicious too! I am so glad to hear from you and your request. I will surely write more of those. With your two little ones, those will be easy for you. what a lovely dish to bring to the first fiesta of 2015! thanks for sharing! Thank you so much for hosting! I am honored to mingle with so many talented bloggers at the Fiesta! Thank you so much Loretta! You are too kind! I always enjoy learning about different traditions and holidays through your blog! I love the positive nature behind Auspiciousness, and of course the almond kheer looks delicious. Thank you so much for bringing it to the fiesta; I’m sure it will be gone quite quickly. Happy 2015! Thank you so much Kaila! I really appreciate the kind words. Thank you so much Sadia! Thank you so much, Nina! I am so glad that you stopped by. You have an awesome blog which is helping so many young children. Great work! Thanks for your kind words Sandhya!